I won this audiobook in a giveaway over at The Avid Reader's Musings a month or so ago. I normally don't buy myself audiobooks unless I am going on a long, solo road trip, so this was a treat for me and it certainly made my drive to and from work more enjoyable. Classified as a collection of "fables," Squirrel Seeks Chipmunk features absurd and clever short stories that include an array of animals that each offers a moral of sorts, emphasis on "of sorts". 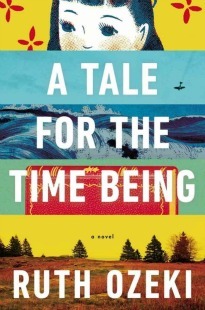 He highlights the amoral behavior of the animals to allow the reader to consider their own morality, or lack there of. 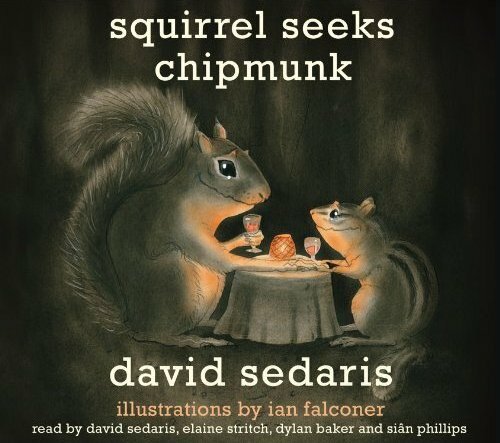 I've heard that David Sedaris is a fantastic narrator to his audio books, and this held true throughout Suqirrel Seeks Chipmunk. However, to my disappointment there were only a handful of stories that were narrated by Sedaris. Of course some stories are more obscene and more entertaining than others, but I especially enjoyed the chapters that Sedaris narrates himself. This is my second Sedaris, and I have to say I enjoyed Me Talk Pretty One Day over this one, though it's hard to compare the two because they are so different. But, if you do get a chance to listen to this one on audio I wouldn't pass it up. It's definitely one-of-a-kind. I enjoyed this one more on audio than I think I would have had if I read the print version, simply because Sedaris' narration adds a lot to the stories. Me Talk Pretty One Day is my favorite David Sedaris book. I have been meaning to read this one, thanks for the review. I'm glad you enjoyed a few of them, but I definitely agree that Me Talk Pretty was better. Still, Sedaris' sense of humor is in a class on its own. Melissa, It is really is! And thanks again for this one! I've looked at this book a few times but haven't actually read it yet. Maybe I'll try to find the audio of it. I wonder why Sedaris didn't read all of the stories for it. I agree with you and I would take Me Talk Pretty One Day over this book. I liked this book, but not like how I loved his other books. It was just a little too different ... maybe the audio version would be more enjoyable? I read part of this one at the bookstore and didn't fall in love so I passed. The cover is so freakin' cute I almost bought it just to put on the shelf... but my better spending-judgement-fairy appeared on my shoulder and told me that was not a good reason to buy a book. I'd choose Sedaris on audio over print any day. It's too bad he doesn't narrate all of the fables though.